Diots de Savoie (Savoy Sausage Recipe) | Simple. Tasty. Good. I had never heard of diots sausages before paying a visit to the Haute-Savoie region in France. How about you? 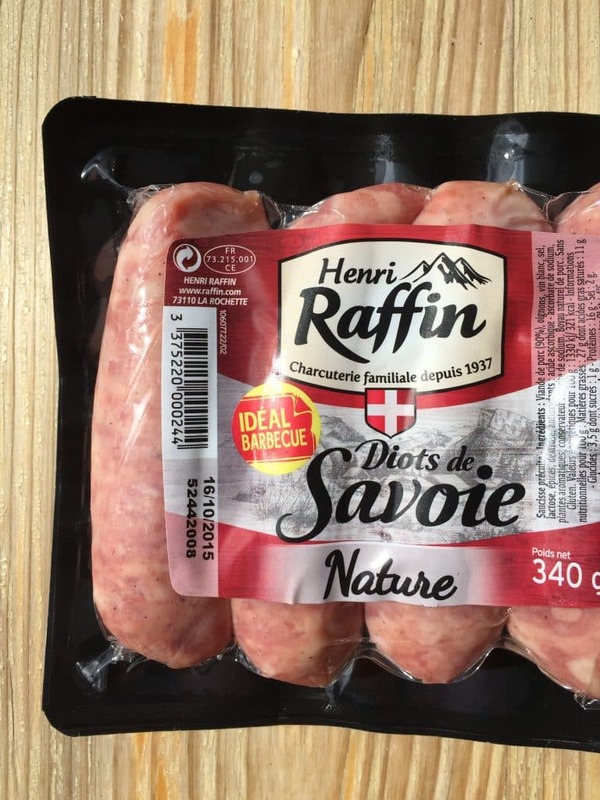 Savoie diots pork sausages are very popular up there. And I definitely can understand why because these diots sausages are super delicious!! These French diots sausages mainly contain a coarse and fatty pork mince that has been seasoned with nutmeg. 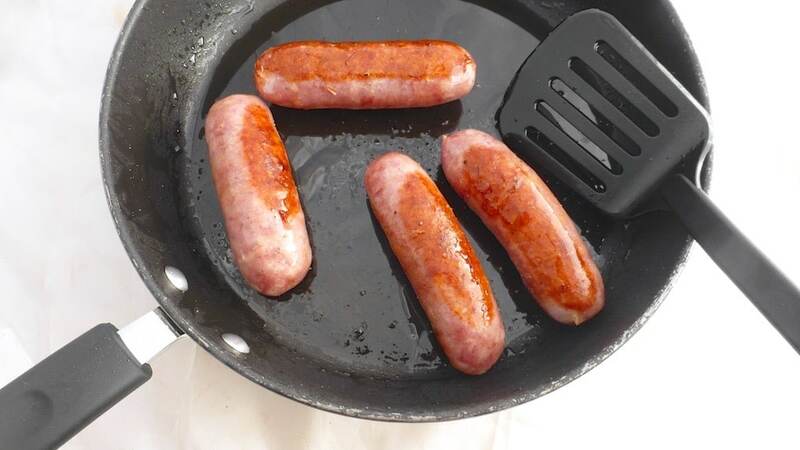 Nutmeg sausages. To die for. Some are small in size, other are larger. They can be fresh (like the ones I used for my recipe below) or smoked. You can boil, braise, grill and bbq diots. You can of course use any other type of pork sausages for this dish if you can’t find diots sausages! On one of our hikes near the Mont Blanc mountains I came across this fragrant wild herb with purple flowers called serpolet. I picked some and realised that this herb resembled wild thyme. So I took some home to our rental apartment the day I was planning on preparing these savoury diots sausages. Great match! Fond of these diots sausages in onion sauce? Then I can definitely recommend you to take a look at my super savory sausages in onion and Guinness gravy over mashed potatoes!! You will love it, no doubt about that. Also check out another French Haute-Savoie specialty I came across on my trip to Annecy and Chamonix: crozets! That’s a cute square shaped (buck)wheat pasta! 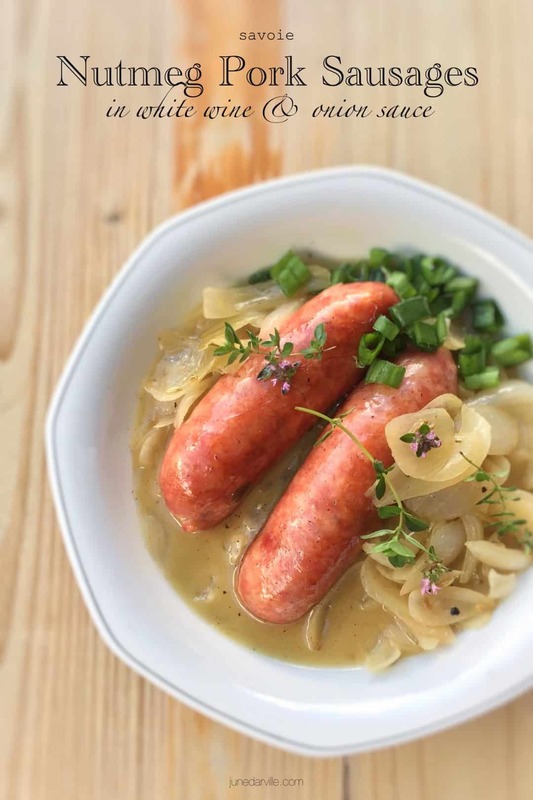 Classic Savoie diots nutmeg sausages in onion sauce! 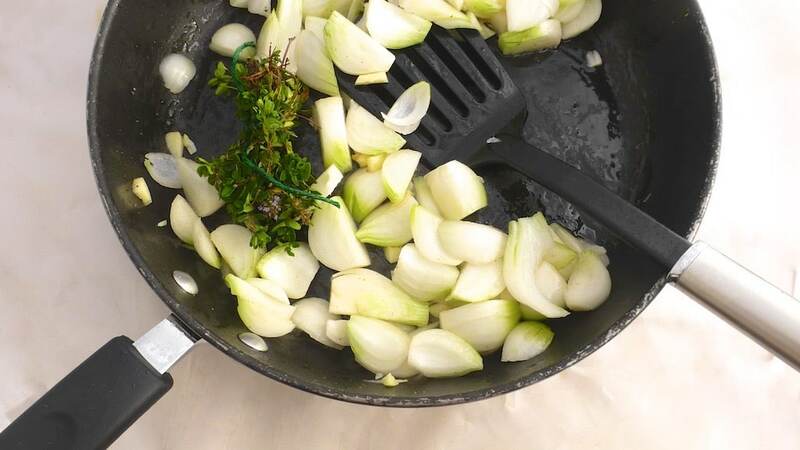 Pour some olive oil in a non-stick pan and place it over medium-high heat until the oil is hot. Then add the diots pork sausages. Gently bake the diots sausages for 6 minutes until browned on all sides. 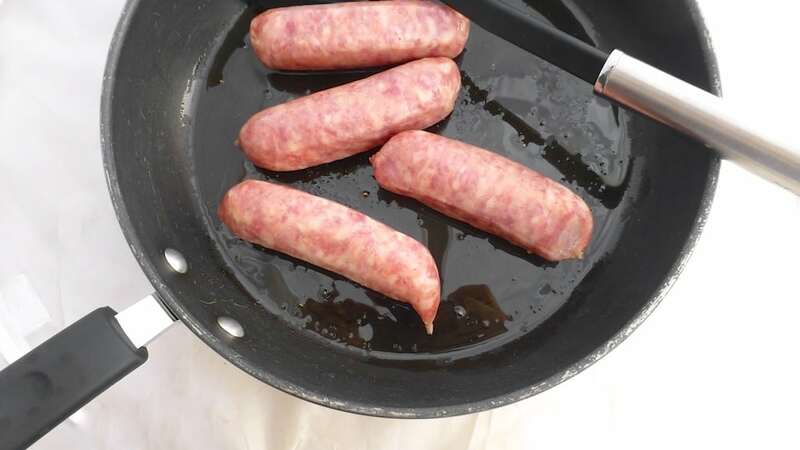 Remove the sausages from the pan and place them on a clean plate for now. Cover with tinfoil. Peel the onion and garlic. Chop them up roughly. Add the garlic and onion to the hot pan together with the (wild) thyme. I tied the sprigs together with some kitchen twine which will make it easier to remove later on. Add some extra olive oil to the pan if necessary. Fry the onion and garlic over medium heat for 8 to 10 minutes. Then add the browned sausages back to the pan. Season with a little pinch of pepper and salt. Pour in the white wine. Bring all the ingredients to a good boil and then turn the heat low. 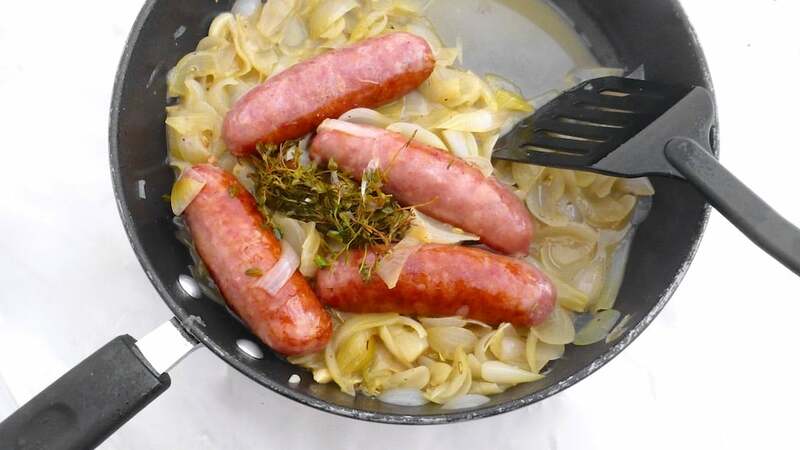 Put a lid on the pan and simmer the onion and sausages for 20 to 25 minutes. In the end check the seasoning of the onion sauce and add extra pepper or salt to taste if necessary. 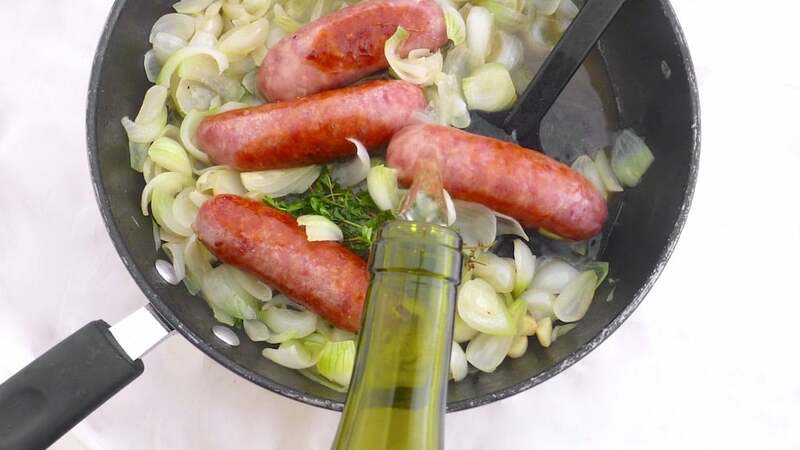 Then scoop the braised onions and diots sausages onto deep plates and drizzle with the rest of the white wine sauce that is still in the pan. Serve hot with boiled or baked potatoes. 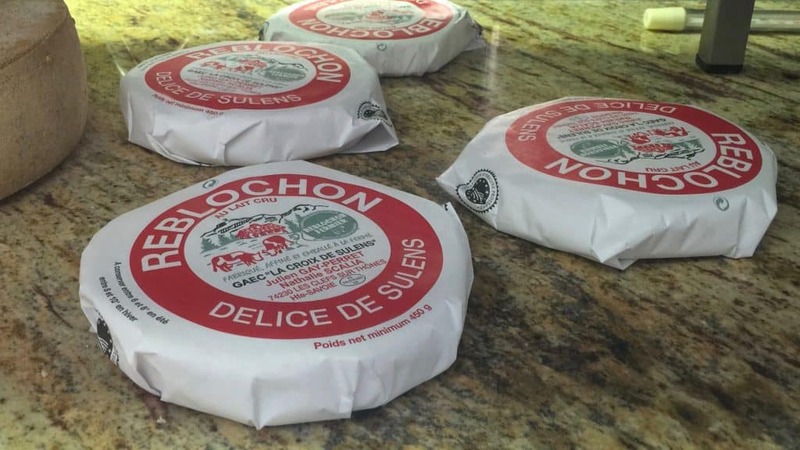 But wait, there’s another cheese from the French Haute-Savoie region that is very popular: reblochon cheese! You must have heard of reblochon cheese before. Well anyway, reblochon is a French pasteurized cow’s milk cheese that has a yellowish washed rind. The cheese has a very delicate but strong flavor and is well known for its creamy texture. And it’s this creamy texture that makes it so delicious, not only for a bread meal but also to cook with. Reblochon cheese melts beautifully! It is used in a lot of gratins and pasta bakes in French cuisine. One French recipe where reblochon is used for is the popular tartiflette, a cheesy bacon and scalloped potato bake. Delicious. Another super tasty recipe that needs this creamy reblochon cheese to shine is a ‘croûte Savoyarde’ or literally translated as ‘Savoie crust’. Another French name for this classic is ‘croûte au fromage’ or ‘crust with cheese’. It is basically oven baked slices of (old) bread in a cream sauce topped with reblochon cheese. 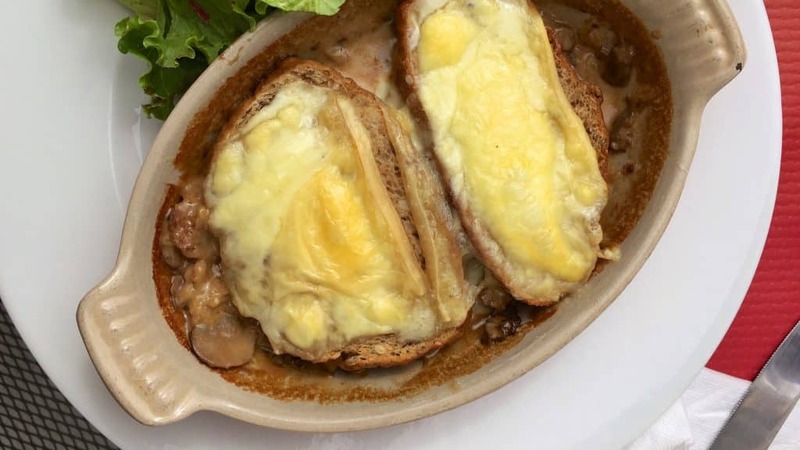 There are a couple of versions of this dish: I love my croûte au fromage in a creamy mushroom and white wine sauce, and a slice of cured ham on top of the bread right underneath the melted reblochon cheese. This dish makes a great lunch or dinner, served with a green salad. This recipe is a great way to use old bread! No reblochon cheese where you live? Then go for a cheese that melts nicely in the oven. If you like a strong cheese just like the reblochon, then I would recommend Epoisses or Chaumes. Not fond of strong flavoured cheeses? Then I would go for Emmental. Enjoy this French bread gratin! Oven baked bread in mushroom cream sauce with reblochon cheese! Lightly toast or grill the slices of bread for a minute Peel the garlic clove and lightly rub the grilled bread with it. Brush the mushrooms and trim them. Slice the mushrooms up. Add them to a large saucepan together with the fresh thyme leaves, the white wine, the cream and a good dash of pepper and salt. Place the pan over medium heat and bring the mushrooms and cream to a light simmer. Let the mixture simmer for 6 to 8 minutes. Stir regularly. In the end check the seasoning and add extra pepper or salt to taste if necessary. Then take the pan off the heat. Pour the creamy mushroom mixture in a large baking dish or two smaller ramekins or dishes. Place the slices of bread on top. Gently push them into the cream a little (they should be soaked with the mushrooms cream in the end). Then top the bread with the slices of cured ham and finish with thin slices of the reblochon cheese. Sprinkle with extra pepper. Place the baking dish(es) in a preheated oven at 400°F (200°C) for about 20 minutes or until the reblochon cheese has fully melted. Remove the dish(es) from the hot oven and serve. Wow! Well that French bread gratin drowning in creamy sauce and melted reblochon cheese looks amazing, right! This delicious French cheese is not only perfect to make great sizzling oven gratins: it is also great in a cheese sauce! This reblochon cheese sauce is very easy to make. Just warm up some cream, season it and let the diced reblochon cheese melt away in it. I also like to add a little white wine to the sauce to give it some extra kick. The best protein to serve this cheese sauce with is chicken and pork. And I’m sure that it will taste great as well with cooked pasta! It’s like a French twist on the classic Italian alfredo cheese sauce. Baked chicken in a creamy reblochon cheese sauce… Poulet à la crème de reblochon is a French classic! Other recipes that you could make with reblochon cheese then: any type of gratin or pasta bake, mac and cheese, quiches, pizza, gnocchi and stuffed potatoes. Any dish that needs easy to melt cheese, this reblochon is your best friend! No reblochon cheese where you live? Then go for a cheese that melts nicely in the oven. If you like a strong cheese just like the reblochon, then I would recommend Epoisses or Chaumes. Not fond of strong flavoured cheeses? Then I would go for Emmental. Baked chicken in a creamy reblochon cheese sauce... Poulet à la crème de reblochon is a French classic! Add the butter to a medium non-stick frying pan and place it over medium-high heat until it has melted. Then add the chicken breasts to the pan. Season with a pinch of pepper, nutmeg and salt. Turn the heat lower and brown the chicken breast for a couple of minutes. Then flip the chicken over and brown it on the other side. Turn the heat lower again and put a lid on the pan. Let the chicken cook for another 6 to 10 minutes or until the breasts are cooked through. Then remove the chicken from the pan and transfer it to a clean plate. Cover with a sheet of tinfoil. Don’t wipe the pan clean. Pour in the white wine and the cream. Bring it to a light simmer. Peel and dice the reblochon cheese into little bits. Add the cheese to the warm cream. Stir well. Season with a pinch of pepper, nutmeg and salt. Then put a lid on the pan and let the cheese melt in the cream for 5 to 6 minutes. The sauce should be very creamy in the end. Check the seasoning of the cheese sauce and add extra pepper, nutmeg or salt to taste if necessary. Then take the pan off the heat. Place the cooked and browned chicken breasts onto deep plates. Drizzle with the reblochon cheese sauce. Serve immediately.